We all get discouraged, frustrated, depressed—even our dogs do from time to time. If you really pay attention to your dog, you might realize that your emotions are more similar than you ever imagined. While dogs can exhibit signs of mood disorders just like any of the rest of us, they can also teach us a thing or two about life. 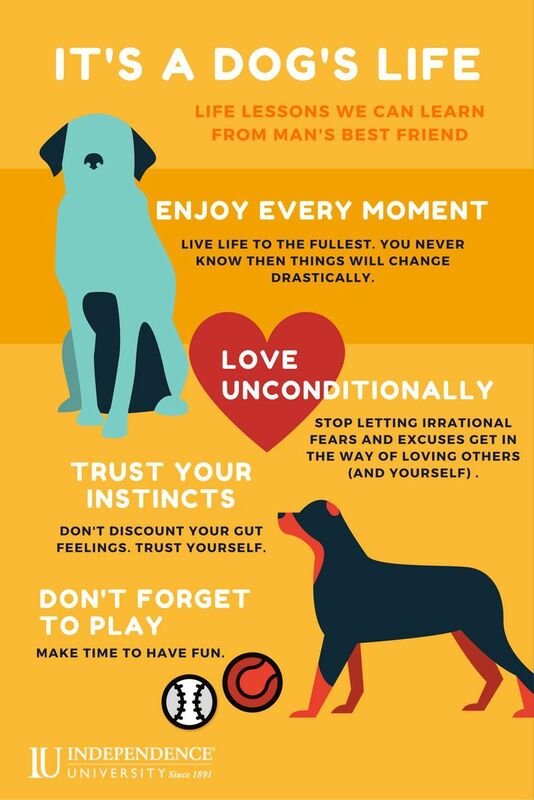 If you really want to let go of the pressures and expectations that are weighing you down and learn to live life to the fullest, it’s time to start taking cues from your pets. You need to live life to its fullest, because you never know when things will change drastically. Think about your dog—she doesn’t spend time worrying about what the next day, or even the next hour, may bring. When she finds something she enjoys, whether it’s a brand-new bone or a worn-out chew toy, she gives it all she has. Our pets allow themselves to fully experience the joy, excitement, and happiness they are feeling in that moment. There’s nothing quite like coming home from a long day of work or school to be greeted by an ecstatic, loving pet. Ask any dog owner! How often do we let a person’s imperfections get in the way of our love, or let our own faults hold us back from truly loving ourselves? No matter what you do in life, how many times you stumble, how poorly you do on a test, or how much of a mess you create at work, your dog will never stop loving you. We need to follow suit and stop letting our irrational fears and ridiculous excuses get in the way of loving others (and ourselves) unconditionally. In life, we are our own worst critics. We doubt the things we think, the way we feel, and oftentimes we discount our gut feelings. It’s time to start trusting ourselves. Your dog listens to his instincts—that’s what helps keep him alive. If your instincts are telling you to turn down a job, negotiate for higher pay, or go back to college, listen up. Start trusting your instincts, and you’ll begin to see that they may steer you in the right direction. While it’s important to be serious and work hard, it’s just as important to find time to play. No matter what they’re doing, dogs can always find the time to play, and so should you. When the workday is over or that long stretch of classes has ended, take the time to do the things you enjoy (like walking your dog or pampering your cat). Doing so will help you reset and prevent you from feeling bogged down by daily life. No matter what you do in life, take cues from your dog, and give it all you’ve got. The next time life gets you down or you’re losing your motivation, consider what your dog would do, and follow suit.